PMC stands for the professional monitoring company. PMC make loudspeakers. PMC was founded in 1990 by Peter Thomas of the BBC and Adrian Loader of FWO Bauch. The combination of knowledge and a life-long passion for the music led to the production of PMC’s first product – the BB5-A – an active main studio monitor. This design was snapped up by BBC Maida Vale and Metropolis Mastering and remains the world’s reference, used by Stevie Wonder’s Wonderland Studio, Prince, Hospital HDTV Broadcast London and for renowned classical labels such as Deutsche Grammophon, Decca and Harmonia Mundi. PMC are one of the very few companies who have been awarded an Emmy® for their contribution to recording excellence. With film, it would be easier to list the blockbuster movies which did not use PMC during the process of music production and post, but titles include: Titanic, Die Another Day, Spiderman 3 and Pirates of the Caribbean and many more. PMC reigns supreme throughout the leading mastering houses, broadcasters and much of the professional world. 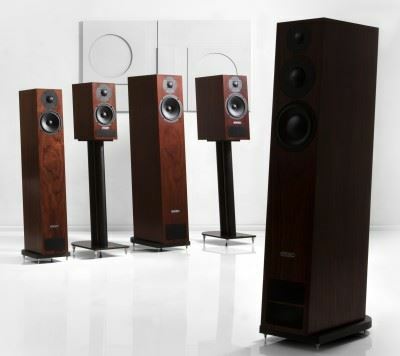 Your favorite albums will almost certainly be recorded and mixed on PMC loudspeakers. When PMC set about designing domestic products they used all their immense experience learned in the studio. 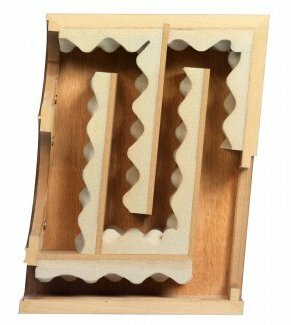 Here you can see the folded bass “tube” inside the cabinet to allow this compact speaker to produce deep and natural bass. PMC believe a good loudspeaker should be able to relay the purest intentions of the artist and give the listener the ultimate audio experience. We find that PMC loudspeakers solve a lot of problems for us. For a start they produce a very neutral and natural sound and yet are dynamic and work in most room environments. They are also fairly compact and aesthetically pleasing. The Twenty series is a superb range from small compacts to elegant floor standers. PMC speakers make little demands on amplification; except that it is good. Perhaps it is easier to say they are hungry for quality, rather than hungry for power. As a result PMC speakers work well with most electronic brands that we stock and always produce a convincing sound in our demo rooms and in the main shop listening area.